It’s the 10th Anniversary of World Juggling Day in Lancaster! On Saturday, June 15, 2019, members of the Lancaster Throwback Juggling Club will host a free fun event to celebrate World Juggling Day. This 10th consecutive event will be held at Lancaster’s Long’s Park on the lawn near the Amphitheater from 1pm to 4pm, weather permitting. Everyone is invited to stop by for free juggling lessons and try out various circus skills. A juggling workshop will be held from 2 – 3pm, teaching the basic juggling pattern and some tricks for advanced learners. Look for signs and red balloons in the park. The bi-monthly gatherings of the Lancaster Throwback Juggling Club are always open to the public. But once a year—on World Juggling Day—we take juggling *to* the public with a celebration at Long’s Park. Mark your calendars now for World Juggling Day 2017, which is on June 17, 2017. And in the meantime, enjoy the video highlights from WJD 2016! On Saturday, June 18, 2016, members of the Lancaster Throwback Juggling Club will join with jugglers from all over the world to celebrate World Juggling Day. The Lancaster Throwback Juggling Club will host a local event in Lancaster’s Long’s Park on the lawn near the Amphitheater on June 18th from 1pm to 4pm, weather permitting. Area residents are invited to stop by for free juggling lessons, or just to watch the jugglers practice and perform. This world-wide event has been organized by the International Jugglers’ Association (IJA) in celebration of its founding in June 1947. Juggling clubs from all over the world are posting their plans for World Juggling Day at the IJA web site, www.juggle.org. For more information on the Lancaster PA event, contact Susan Williams at (717) 471-6895 or williams724@hotmail.com. Another World Juggling Day has come and gone! Thanks to everyone who came out and cut their way through the humidity. It was a great time for both club regulars and visitors who were willing to try their hand(s) at juggling. A special thanks to the team from the Lancaster paper who covered the event! You can check out the feature in today’s paper, read the article online, and even watch a video feature below. Enjoy, and we hope to see you at Long’s Park in 2016! On Saturday, June 20, 2015, members of the Lancaster Throwback Juggling Club will join with jugglers from all over the world to celebrate World Juggling Day. The Lancaster Throwback Juggling Club will gather in Lancaster’s Long’s Park near the Amphitheater from 1pm to 4pm, weather permitting. Area residents are invited to stop by for free juggling lessons, or just to watch the jugglers practice and perform. Jugglers across the globe will be doing likewise to spotlight juggling, and generate enthusiasm for and awareness of juggling among the general public. This world-wide event has been organized on the internet by the International Jugglers’ Association (IJA) in celebration of its founding in June 1947. Juggling clubs from all over the world are posting their plans for World Juggling Day at the IJA web site, www.juggle.org. For more information on the Lancaster PA event, contact Susan Williams at 717-471-6895 or williams724@hotmail.com. Information on the Lancaster Throwback Juggling Club can be found at www.LancasterJugglers.com. Another snowy Tuesday, combined with freezing temperatures, equals another cancelled Juggling club session tonight. Let’s all be safe and stay off the roads tonight. Practice juggling at home with leftover fruitcake from the holidays, or keep your New Year’s resolution and work on learning a new trick / skill this year! We will try to meet again for our next regularly-scheduled juggling meeting on Tuesday, January 20th, weather permitting. Please note that tonight’s Lancaster Throwback Juggling Club meeting has been canceled. Please join us for our next scheduled meeting on August 19th at 7:00pm. 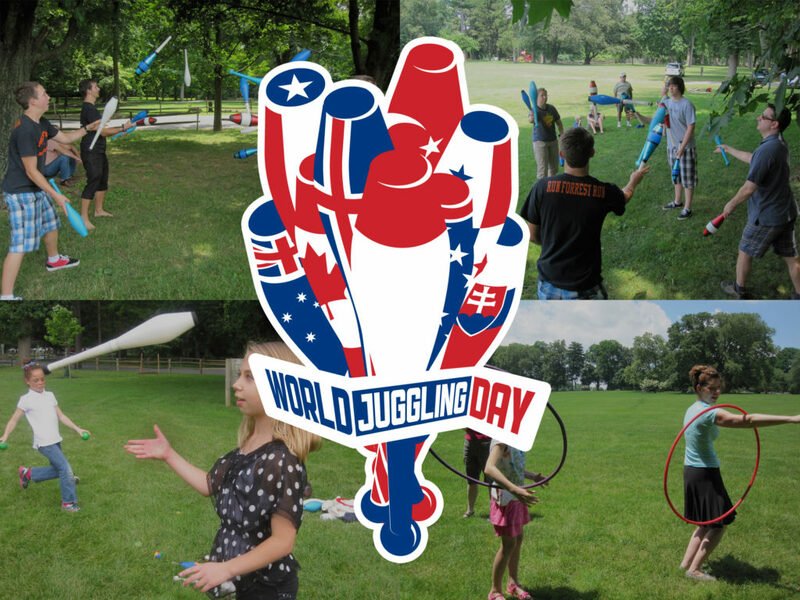 On Saturday, June 14, 2014, members of the Lancaster Throwback Juggling Club will join with jugglers from all over the world to celebrate World Juggling Day. Juggling clubs from all over the world are posting their plans for World Juggling Day at the IJA web site, www.juggle.org. For more information on the Lancaster PA event, contact Susan Williams at (717) 471-6895 or williams724@hotmail.com. Another World Juggling Day has come and gone. The Throwback Club had an excellent day for spreading the love of juggling. Check out the replay and be sure to mark you calendar for June 14, 2014 when we hope to do it all again!